Once considered a protected male preserve, symphony orchestras are becoming the most gender-blind employers in the U.S. The St. Louis Symphony had 18 women out of 88 musicians in 1964. In 2016, more than half of its musicians were women. During the same period, the Chicago Symphony Orchestra went from three women out of 104 to 41 out of 102. And the New York Philharmonic went from no women to 41 women out of 100. 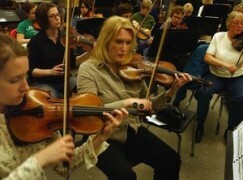 Today, over 50 percent of the chairs in the top 250 U.S. orchestras are filled by women. The link in the starter is “blank”. I wonder what the top 250 orchestras are? Anyway, in smaller semi-pro and amateur groups this is clearly true – and in some groups women make up more like 75%. In some groups I know there are only a couple of men in the violins, a few more in violas and cellos. Basses remain a men’s domain – but not exclusively. Winds are really sexist – flutes and oboes tend to be women, clarinets 50/50, bassoons tend male. It’s 50/50 in horns and trumpets, but trombones and tubas the men dominate. Percussion is likely male, timpani either. It has to do with schooling. Boys are directed to sports, women the arts. It’s a very sexist thing. There’s also a serious racial division – there are very few blacks in American orchestras. More Latinos, but boy are the Asians coming on strong. There are more and more women conductors, but nowhere near parity with men. When it comes to composers there’s no competition. Why not just stereotype everybody. The Philadelphia O has an all male flute section. The bassoon section has 2 males & 2 females. It has a female tuba player as well as a female timpanist. Bob Langevin is principal flute in the NY Phil. Chicago has 2 males versus 1 female in the flute section. Cleveland, StL, Detroit, LA, and SF have a male principal flute. The MET flute section is 50/50. BSO has a male flute player and a female bassoonist. St. Louis has a female associate prinicipal trombonist and Pittsburgh a female co-principal t-bone. It goes on and on. — not that the musicians have ever had a lot of say in who their next conductor will be; but the boards that do the hiring may be less resistant than in the past.